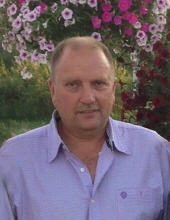 It is with broken hearts and a deep sense of loss that the family of Walter Anutooshkin of Wainwright, Alberta, announce his passing at the age of 60 years, on Tuesday, March 12, 2019 at the Wainwright Health Centre. Walter is survived by his loving Partner, Shari Kelley and her children, Connie Kelley of Edmonton, Alberta and Tara (Brent) Sieben and their son Blaise of Wainwright; his mother, Cate Redden of Chilliwack, British Columbia; sister, Tracey Anutooshkin of Chilliwack; brother, Jeff Frey of Chilliwack; nephews, Max Gilchuk and Brody (Caitlin) Gilchuk. He was predeceased by his father, Sam Anutooshkin. A funeral service will be held on Friday, March 15, 2019 at 10:30 AM from the Grace United Church, Wainwright with Reverend Ann Marie Nicklin officiating. Interment will follow in the Wainwright Cemetery. "Email Address" would like to share the life celebration of Walter Anutooshkin. Click on the "link" to go to share a favorite memory or leave a condolence message for the family.